Our Bunk Beds are made of a solid tropical hardwood, they work to save you space (for more play room) and allow your children to sleep comfortably in a twin over double sized Bunk Bed with a Stair Case. The Dylan bunk beds with stairs feature 6 open-concept bookshelves on the end and are the ideal choice for parents wanting a bunk bed that has a modern contemporary flare, but manages to retain a classic look and feel that complements their child’s room no matter its style or aesthetic for years to come. Offered in a warm grey slate finish the Dylan bunk beds are perfectly suitable for either a boys’ or girl’s room. The staircase and bookshelves are constructed to be universal for positioning on either side of the bunk bed. A complement to the Dylan bunk bed, the 4-drawer chest, offers its traditional styling and hand-crafted look. The top drawer is separated by a decorative trim that creates the illusion of a top double drawer. The drawers feature metal ball bearing glides, solid wood English dovetail joints, and beautiful aluminum powder coat finished finger-pull handles. 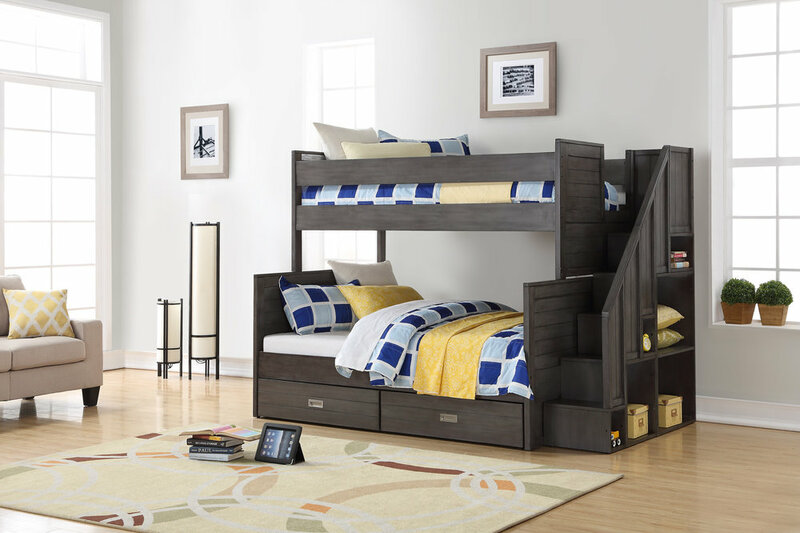 The Taylor bunk beds with stairs featuring 6 open-concept bookshelves on the end, are the ideal choice for parents wanting bunk beds that have a modern contemporary flair, but manage to retain a classic look and feel that will complement their child’s room no matter its style or layout for years to come. Offered in a pure arctic white finish, they are perfect for a boy or girl’s room. The staircase and bookshelves can be situated on either the left side or right side of the bunk bed. A complement to the Taylor bunk bed is the 4-drawer chest with its traditional styling and hand crafted look. The top drawer is separated by a decorative trim that creates the illusion of a top double drawer. The drawers feature ball bearing slides, solid wood English dovetail and beautiful aluminum powder coat finished handles. Included with your purchase is an Anti-Tip kit, that is easy to install and gives you piece of mind. 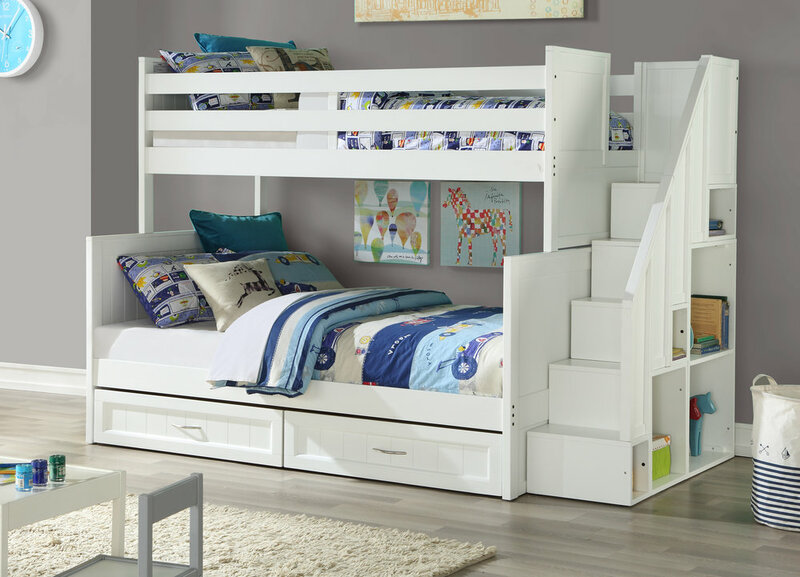 The Noah bunk beds with stairs featuring 6 open-concept bookshelves on the end, are the ideal choice for parents wanting bunk beds that have a modern contemporary flair, but manage to retain a classic look and feel that will complement their child’s room no matter its style or layout for years to come. Offered in a chocolate finish, they are perfect for a boy or girl’s room. The staircase and bookshelves can be situated on either the left side or right side of the bunk bed. A complement to the Noah bunk bed is the 4-drawer chest with its traditional styling and hand crafted look. The top drawer is separated by a decorative trim that creates the illusion of a top double drawer. The drawers feature full-extension ball bearing slides, solid wood English dovetail and beautiful aluminum powder-coat finished handles. The Ryan bunk bed with reversible stairs features 6 open-concept bookshelves on the end and is finished in a warm burnished grey brown colour. This is the ideal choice for parents wanting bunk beds that have a modern contemporary flair while still retaining a classic look and feel that will complement their child’s room no matter its style or layout for years to come. The 6 open cubby shelves are integrated in the staircase section of the bunk bed and offers ample storage space for your child’s toys and books. There are also two freestanding storage drawers on casters underneath the bunk beds for added storage. The staircase and bookshelves can be installed on either the left or right side of the bunk bed. The staircase and bookshelves can be installed on either the left or right side of the bunk bed. A complement to the Ryan bunk bed is the 4-drawer chest with its traditional styling and hand crafted look. The top drawer is separated by a decorative trim that creates the illusion of a top double drawer. The drawers feature full-extension ball bearing slides, solid wood English dovetail and beautiful aluminum powder-coat finished handles. 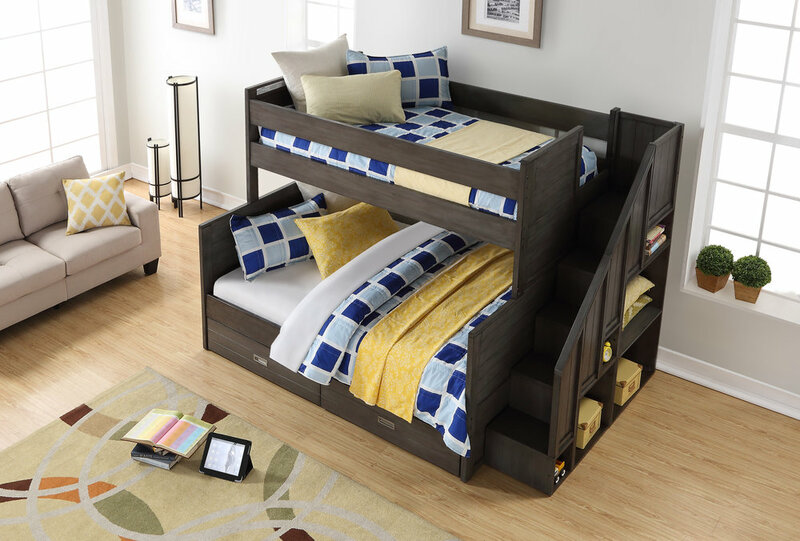 The Zachary bunk bed with universal stairs featuring 6 open-concept bookshelves on the end is the ideal choice for parents wanting bunk beds that have a modern contemporary flair, but manage to retain a classic look and feel that will compliment their child’s room no matter its style or layout for years to come. Available in a Sierra burnished walnut color. The 6 bookshelves on the end of the bunk beds offer lots of storage space for your child’s toys and books. There are also 2 freestanding storage drawers on casters underneath the bunk beds for added storage of toys, blankets or clothes.The staircase and bookshelves can be installed on either the left or right side of the bunk bed. A complement to the Zachary bunk bed is the 4-drawer chest with its traditional styling and hand crafted look. The top drawer is separated by a decorative trim that creates the illusion of a top double drawer. The drawers feature full-extension ball bearing slides, solid wood English dovetail and beautiful aluminum powder-coat finished handles.